It is not unusal at all for the person who is ill or the family and friends that surround the patient to have some profound grief. 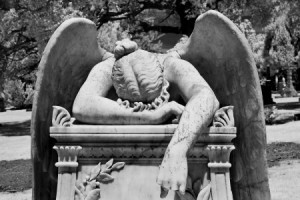 Sometimes this is called anticipatory grief, because death has not come, yet we are still grieving. It is surely very natural to have grief around any terminal illness. This article is written by a grief counselor with Mt. Hood Hospice who has led many, many families through this process. I am very grateful to her for sharing this with us. Energy! Activity! Youthful appearance! Vibrant health! Look at any magazine at the check-out counter for an overview of important cultural values. You may also see the importance we place on competition, left-brain logic, positive thinking and material success. These are wonderful values, but they can leave us ill-equipped to understand and support each other when times are tough, such as in times of grief and loss. Many of the complications that arise for us around the natural processes of grief, and death and dying, come from the clash between the inevitable realities of old age, sickness and death and the values bequeathed to us by a vigorous, forward-looking society. Grief is counter-cultural. Many of us express this clash in the vocabulary of confusion. “I think I’m losing it.” “I feel like I’m going crazy.” Underlying the feeling that what we are experiencing is not normal is a terrifying snake pit of difficult questions. What is the difference between acceptance and “giving up”? Where does hope fit in? How do we incorporate positive thinking into a realistic plan for the future when we have a life-limiting disease? How do we open our hearts to the healing properties of love and forgiveness when all our strategies for coping with illness are framed in terms of war and combat? Busy is the word of the day. Busy is the answer we give when someone asks us how we are. Busy is a sacred cultural value. Busy is the armor we put between our experience and our heart. When we stay busy, we don’t have to feel. Don’t misunderstand – staying busy is a fine strategy which works well until we get home at night, or have a break between appointments, or run out of people to have lunch with or rooms to remodel or money to spend. By all means, stay busy if it’s helpful. But also learn how to be still. Set a kitchen timer for five minutes, sit in a chair and start the timer. Don’t move until the timer goes off. That’s it – that’s the whole exercise. Do this once in the morning and once at night for a month, then go to ten minutes. Five minutes is plenty to start with, unless you don’t have time. Then, as the saying goes, sit for an hour. The above practice will soon give you the space to identify what you are really feeling. Naming these feelings as they kaleidoscope through your mind and body is a powerful and helpful skill. This skill can put enough space between a trigger and your response to give you some options about how to respond. In grief, the first arrow is usually sadness and/or profound loneliness. This is quickly followed by the additional arrows of anxiety, shame, embarrassment, guilt, confusion, anger, fear and alienation. They are optional. The practice of naming your thoughts and feelings described above will enable you to distinguish between these arrows – i.e. which feelings are directly connected to your loss and which are reactions to a reaction. People who are grieving a death or anticipated losses very often hold many conflicting ideas to be true simultaneously. These conflicts are delusions created by language. Hope does not stand in opposition to acceptance, or positive thinking to realism. When we get a routine physical we hope that the results show no diseases. When there is a pathology found, our hope is that there is a treatment to cure it. When our doctors cannot offer us any treatment, what do we hope for then? For comfort? For reconciliation? For forgiveness? If “giving up” means casting out hope then we never have to give up on anything, we simply need to redefine what hope means to us in our new situation. You may have been taught to soldier on and to be “strong” in times of difficulty, and you may have concluded that strength means not showing any feelings. Think about what strength means to you. Journaling, support groups, or just one like-minded friend to mirror your experience can go a long way towards dispelling the second arrows of alienation and stigma attached to death and dying. It turns out we are all mortal, have all suffered losses and all experience fear. You can call this a pity party, or you can call it compassionate support. This means to be your own expert. You don’t need anyone to tell you how to feel, and how you feel needs no defense or explanation. It might not make sense to the linear logic of your left brain but, it turns out, the left brain has some serious limitations. We all live with the expectation of death. The lucky among us will see 80-90 summers. This is worth contemplating. Beyond the fear and sadness is it possible there is something else – an appreciation for the shocking and unlikely adventure of human life and for our fellow travelers?